Hello and top of the year to you all. Here in “sunny” Italy I’m ready for this new round, let’s see though if my old computer is willing to collaborate allowing me to connect. It’s been an ongoing battle for the past few weeks. The photo I’ve chosen to work (play) with was taken on the 27th of December. 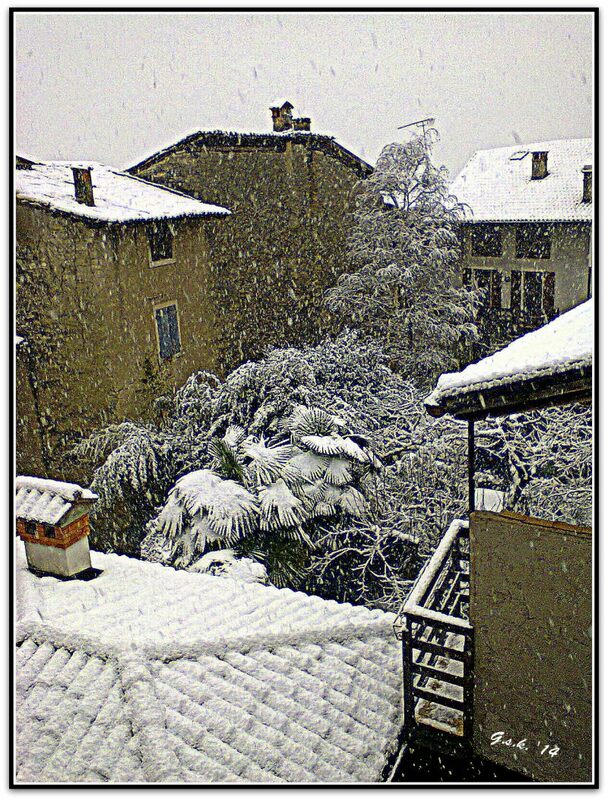 Here in my valley on Lake Garda, we rarely get snow, and if we do it just barely covers the roof tops, so it was really an exceptional opportunity to get a shot right outside my window. The first thing I’d like to do is bring that snow out … so I shadowed a little and then used the HDR filter on Picasa 3 to see what happened … the results were quite satisfactory, so I added my borders and here you are! and long long winter nights. This entry was posted in One Four Photo Challenge and tagged Bolognano, Italy, Landscape Photograpy, One Four Challenge, photographic experiments, Trentino. Bookmark the permalink. Love what you’ve done Georgia, as you can really see the snow flakes in this edit. Like your poem too. Thanks … it was rather disappointing that the camera didn’t catch those snow flakes or rather that i couldn’t see them .. glad you enjoyed the post. Loving the snow Georgia!! It has a slight abstract look in the processed version. The borders are a nice touch! Well done!! 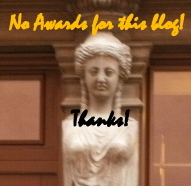 Thanks … it’s the HDR effect of Picasa but I also warmed, shadowed etc. before I got to figuring that maybe the HDR would bring out the snow … thanks for looking on! Well, you certainly brought out the snow in your edit…I feel the cold from here! Sorry about that .. hope you didn’t have to put on a coat! So glad you were able to join us Georgia! 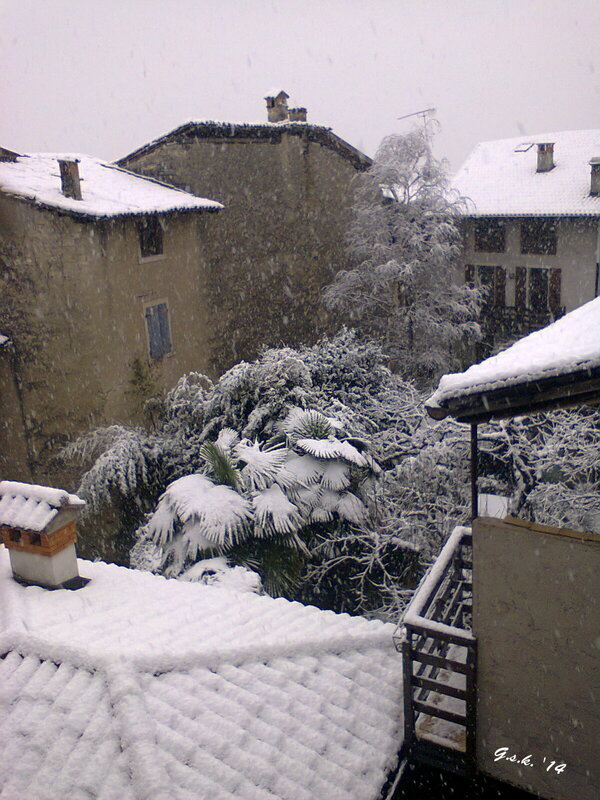 Beautiful snowy view from your window and when it’s rare it’s even more special. We had one of those events here last October. There is a wonderful quietness – at least there was for us. I was happy to be able to join! Was a bit worried as I’m having problems uploading and even opening blogs with lots of photos … sigh. BTW … I don’t understand how you use tags to get to your readers … is there a tutorial for that? At the mo’ I go to your blog and click the pings to look at other peoples work … but sometimes get lost and open the same blog twice. Yes … usually calm and serene, unfortunately my son was to stay an extra day but left early because of the snow .. unbelievably here the trains sometimes get blocked when it snows! Georgia, Im thinking about creating a tute for the Reader. Quite a few folks seem unsure about how it works. Will be after the holidays. I am back to work next week. When you go into Reader – click on enter a tag and type in One Four Challenge, then add. Cool … thanks for teaching this old dog a new trick! Wow you live somewhere so pretty and nothing makes it look prettier than a coating of snow – something we get rarely here so heavily. I like the concept of capturing the snowflakes which your process did really well. I was happy to stumble onto this aspect of the HDR app of Picasa it totally wowed me! We rarely get much snow, we have a very big lake that acts like the sea and keeps our area warmer than the rest of the north. In fact we have palm trees, olives and lemons! So this was so exceptional that I grabbed my camera! Thanks for your comments btw, always nice to see you. Wow! that snow is amazing on the palm trees and such a heavy coating. Love the edit how it brings out the falling snowflakes. It must have been an incredible sight. Glad you used both parts for this challenge. Both parts? Do you mean the before and after … I try to post each step as I edit .. not the actual editing process though. Glad you liked the waka!